My earliest years were wrapped up in a little village church, where everyone started as friends and became a family. It was a body of humble people - dairy farmers, groundskeepers, receptionists, carpenters, housewives. They perfected the carry-in lunch and someone always had extra when we forgot our own table service. We sat in the pew - middle section - sometimes I sucked on the one in front of me. I can still taste the tang of the varnish. All I knew was that Jesus loved me. He loved me because they kept on telling me He did, and I trusted them, because they popped corn in the cooker well past dark on summer evenings and laughed with my parents until the whole room shook. One day, when some might say I was too young to understand, I asked Jesus to live in me. Before long I had my gray Awana shirt and made it my mission to memorize the most verses so I could win the trophy. Nothing ever stays as good as we think it should and before long, lots of adults got in the way, disturbing the tenuous balance of my universe, pitching me straight out of my safety net. My family left that church. In my mind, that's where the trouble started. It's been a long road between ages 8 and 37. My faith charts well outside the plot of a steady incline. It's marked with swells and dips, and maybe that's unavoidable. Maybe almost everyone would say the same. Somewhere along the way, people stopped reminding me that Jesus loved me. I grew in years and it became more about what I should do than what had been done for me. I had the power to make Jesus sad, to incite God's wrath, to hurl a mountain into the ocean, or to prove my infant faith to everyone and doubt for one second - doubt anything, for any length of time. I could insist that I deserved great wealth, I could say one million times that he should be healed - that he was healed already. I wonder if things could have been different if we had been allowed to see the quieter work of a God who transforms a life over time, by repeated exposure to the boldness of His love amid personal failure, by the simplicity and power of His word. Maybe then I wouldn't have walked into adolescence and adulthood with a cynic's view of Christianity and a penchant for disproving my own brokenness. I can't bend time, but I have a hunch that it would have served me well to learn by repetition that God wanted me low, humble, needing much, clinging always and only to Him for survival. Jesus loves me. He saved me because He knew I needed saving. He knows I'm destined for failure outside of Him, but spotless in His sight. I am a mess and so are the rest of His loves, but there's no end to his mercy. He screams and cheers and street-fights for me and He won't ever stop. He needs me to go to His people and He needs me to not care at all what it might cost. Because to live in Him is gain. It's all there is. 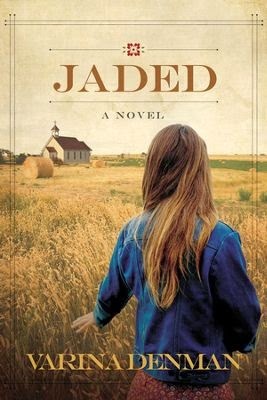 I'm sharing part of my "When Church Hurts" story today as part of a blog tour for Varina Denman's new book, Jaded. Varina's team has kindly offered two copies to FPFG readers. Leave a comment to be entered! Tell me a church story or what you're wearing today or anything in between. I'm easy. :) Winners will also receive a bonus copy of Then Sings My Soul from Amy Sorrells. I went through a difficult church situation a couple years ago. I was hurt by it, and hurt by the way the people of the church and my family acted by it. It left me feeling lost and spinning out of control. After hopping around and never finding my footing in a "comfortable" church I decided to listed to God and go back to where it all began. 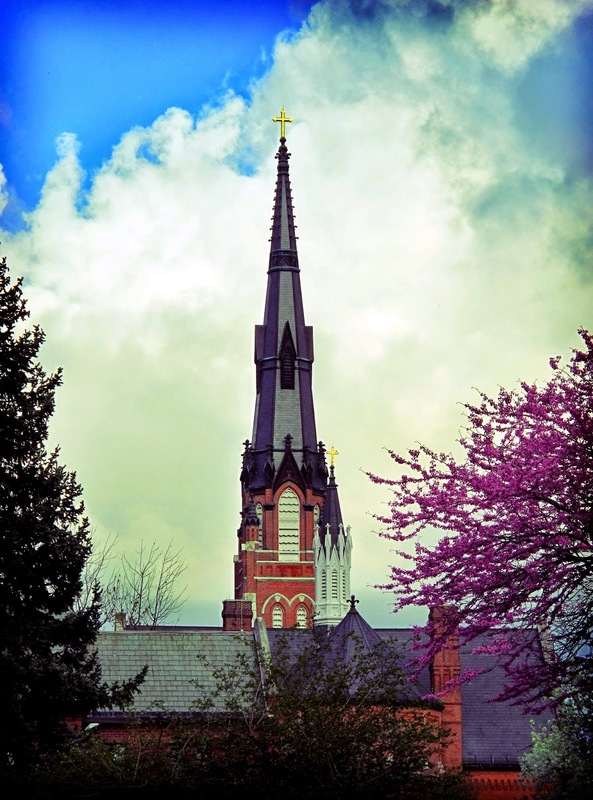 I've realized that it's not about the building, the people, or the steeple, but it's about Him and all of His Glory! The Lord has shown me where I need to be and that's just where I want to be, with Him! Bravo, Kim! Having watched a fair amount of leaving in the past ten years, I think you have made perhaps the most difficult choice. I always say leaving is way easier than staying, but going back may be even harder than that. May the Lord richly bless you in your "new" church. I have been through several hard church situations and lived to tell about them. :-) I learned a lot about who God is and who He isn't! For that I'm grateful. BUT, my most recent church "situation" has honestly been the sweetest one EVER. Our small church merged with a larger church so that we could be "better together". It was handled with humility, grace, service and love. There was no pushing or shoving or jockeying for position. The question was always asked both ways, "How can we make this easier for you?" It was all about reaching our city more effectively for the glory of God. BEAUTIFUL! I think I might be your earliest morning reader! I seem to sneak into the top three comment spots a lot. My church story is kind of long and involved, so I won't go into that here, but it's kind of a combo of beauty and darkness, into confusion, then into light, each stage taking years and years and years (decades), and I feel like a baby in the light. I'm sipping coffee, watching Curious George out of the corner of my eye, and I'm wearing 10 year old, bleach stained black "velvet" fat pants from when I was pregnant with my second son. . . who's now 13. So. . . I look hot right now. ;-) I'd love to read Veronica's book! Oy. Varina. Where did I get Veronica?? Sorry! Thanks for the opportunity! Tshirt and jeans kinda day! I will never forget being a teenager, teetering between "die to self/live for Christ" and wanting so badly to assert my own independence and do whatever I wanted to do. I remember going to the guest speaker at our church praying for my Mom who had been sick and him telling me that if we went home and laid hands on her, she wouldn't need surgery...because God told him so. I struggled so much reconciling the fact that my mom did need surgery with the fact that God was still good. It took me years to understand is that there is so much beauty in this: that God is still God even when we mess it up all the time as humans. That everything that happens is for our eternal good, even if it doesn't feel good right now. That we will fall short over and over again but He will bridge the gap between who we are and who He longs for us to be for His purpose. Ugh. This is me right now. Thanks for sharing. Would love to get my hands on a good book too! Thanks for everything! I love reading your blog. It's a 'real' that is a great 'read'. I grew up in the church, a church that was filled with family members and people who felt like family members. Same story as yours really. Maybe it's a part of the maturing process, we have such innocence when we are little we can't help but, at some point, grow up and see people for what they really are. Imperfect, sinners, in all different stages of faith. The real mystery is how we can grow up hearing over and over that we are sinners and Christ died for us, and then be so surprised when we get old enough to see that, gee, we really are all sinners. Heaven knows there are a lot of people in the church who just don't get it. Their imperfect understanding of scripture melds with my own imperfect understanding and a crisis of faith is just waiting to happen. All I can say is the struggle is part of the journey. We all have to walk it and keep searching for what God wants us to learn. Oh the wisdom in your words, Kathleen! I hope your comment is read by many! Same thing happened to me. I'm looking for a "church", but its been so hard and painful, I'm thinking I must be looking in the wrong places. Words such as yours help so much in really, truly seeing what faith is about. Because I have a feeling my church is not so much the place I've always thought it must be...it's way more personal and "real". It's there...I know it is...it must be, because every time (every! time!) I am about to shrug and give up and slip into the easy "whatever", I am gifted slivers of hope that literally move my foot forward another step. We love our church in Dallas! We have grown, been challenged, and are pointed back to Christ! Linden, I'm so happy you have a wonderful church home. God is good! looks like an interesting read. i'm intrigued. and kind of anti-church, in a way. but not completely. my outfit - comfy all the way. grey and blue floral leggings and a cozy sweatshirt with a scarf of course. happy thursday to you! Karen, thanks for considering my little book. I hope you're able to read it. And...I'm in sweats too! What else is there? I left church on Sunday more discouraged than when I arrived. It's hard to be a part of a body that isn't yours. I've been through seasons like that too. It can be discouraging, but for me, those times come and go. I know that feeling well. I'm so sorry. I enjoy your blog. Thank you for your goodness. This reminds me of the difference between the church--an organization of imperfect people that sometimes hurt each other--and the Gospel. The good news about Jesus Christ and how my knowledge of Him strengthens me is what keeps me going to church. Thelma, thank you for your reminder to keep focus on Jesus, the source of our strength. Very wise! Catholic school, Catholic Mass...enough said. I LOVED Catholic school and LOVE Catholic mass. That is where I have found my home, and both helped to develop my personal relationship with Christ. As a pastor's wife I am sure there are times I have unknowingly hurt others and I in turn have been hurt. I want to be that person who keeps reminding others how very much Jesus loves them. So excited about a new chapter in our church's life. Julianne, I love your heart! Black work out pants (in case I actually feel like moving...), gray tee and a fleece. Oh yes, I've been disappointed by churches....and at times have wanted to be done with all of it. Then like Peter in John 6, I realize and confess (yet again) that only Jesus has those words that lead to eternal life....and He calls us to live in unity with other believers. I so identify with Andrea's comments about the Israelites! I grew up amazed by their foolishness and when I realized that I am NO different, ouch! Thanks for this giveaway-sounds like a good read. We are right smack in the middle of trying to figure out the church stuff right now . . . its kinda yucky if we're honest right? Gray jeans, red shirt & black shoes. Have a great day Shannon. Thank you. I went to a meeting about the welcome ministry at our church last night. I agree with the need for this as well as a discipleship program, but I'm not in accord with the way in which we are going about it. I'm trusting our church leaders have carried this in prayer to know that this is the path we should take. Outfit: same one I've worn for the two previou I've been out of pajamas. It's a crazy time! Jeans, tee, and my favorite coziest sweater. I wear it way too much. Sign me up! this book intrigues me for sure. I am part of a group of Christians that are really struggling right now. Its been good and bad for me, but mostly it has helped me see that I need to make things my own. I can't just listen to the preacher and believe every word he says, I need to go to the bible and prove it out myself. When I am depending on God, and not man, life is better, and more peaceful. I have never doubted God's love for me, and that is not because of any preachers, but because of my parents. They taught us that Jesus loved us, no matter what, and they reinforced that message themselves by loving us no matter what. I am so blessed by that!! I drive a good 40 minutes on Sundays to the church I grew up in because it still feels like home. I wish that for everybody - not so much the long drive, but a church family who embraces and loves. I wish it too. I think I understand why. I would drive 40 minutes if my home church still existed. I wish it too! Oh yes, I do! This sounds like church I grew up in - the description and also the feeling. It was small, it was uncool, it felt like family. Of course it wasn't perfect. I feel like whenever I try to explain my current inability to find a church or inability to even try, this is the line parroted back to me. That church had fights and they were ugly. That church hurt people. But looking back, my memories were good. I felt at home. I felt safe. I felt, for the most part, loved. I wished as a teenager we were a big, cool church. I would give nearly anything to go back to that little, uncool church now. I graduated and got a job in a megachurch. It wrecked me. My childhood church is gone and was sold to become a warehouse. I found a little, similar church for a while and it felt like I had come back home, but they changed their schedule and it makes it difficult to be there, because of my work schedule and because of my almost-PTSD from the megachurch. So... there's that. I grieve it regularly. Sarah, I'm so sorry you had such a negative experience. You're right that it's like grieving, almost as though someone has died. I pray you find a group of believers soon. Hang in there. Kristenas, your story breaks my heart. Thank you for sharing it. I pray you've found a group of Christians to lean on now. I don't know what I would do without my church friends. I am in an aging and dying church, but God doesn't want me to give up on it yet….praying! Thank you for loving those Christians. I'm praying for you too! I left a church after 30 years when it became apparent that the messiness of our family (husband giving up on God, son a heroin addict (now in recovery), and 2 time convicted felon, daughter and I reeling from all of the fall out, did not fit into the "pretty picture" they wanted the world to see. It was simply another in a long list of betrayals at that point (friends, family, etc) that rocked my world. Church and the people that make it up was supposed to be the "safe place"- and it was anything but! I was a part of Mars Hill church, a church that imploded in a big way and got talked about a lot in the media this past year. It was a painful experience, but I still love the Church, and there is healing on the other side. I have learned that Jesus is the only head of the church, and the only one who should be on a pedestal. Dawn, I'm so sorry you had to go through that, but it sounds like you have a beautiful heart for the Lord. Thank you for sharing your experience and your wisdom. We have moved from a large church in a nice area with lots of resources to a small local church in our neighborhood that is hurting. wow, it is hard. in more ways than we could have imagined when we were pulled to this decision by God. Julie, thank you for your willingness to follow the call. You're a good example to me. Sounds like a terrific idea for a book. This message is sure to resonate with anyone who is part of the body of Christ. We are imperfect, passionate, stubborn and too much like the Pharisees. Therefore, getting hurt is more the rule than the exception. I'd love to read it! Thanks. I feel like you're telling my story, Shannan..."it became more about what I should do than what had been done for me." I fight against those messages from my childhood and teen years every day, preaching the gospel to myself again and again, that Jesus came for the sick, the desperate, the helpless. Thank you for the reminder today! lots of painful stories too. i get your words here.~ so sad so much hurting comes from within the body. if only we could keep that perspective as kids in our gray awana shirts.. the worst thing being not having all our verses memorized. and if only more christians followed those verses they memorized, eh? appreciate your story. grateful for grace. for healing. He meant for me to read this today. I've been through some interesting church situations. The first few instances I heard about or witnessed when I was young, so of course I didn't fully understand. Now that I am an adult, they are more personal or I feel more affected by it. Just this week I was told that a summer internship fell through. I was disheartened and left wondering why I felt led there just for it to fall through. Your words were the perfect reminder that God wants us continually relying on him. My silly plans are absolutely nothing compared to His will for my life. I'd love to share this with some friends who were incredibly hurt by the church where I spent my growing up years. The pain is deep. And rather than comfort, they're usually given heaping doses of guilt. We just moved to NC, and have found an amazing church that we all enjoy. I love hearing my kids ask to go to church, and to hear their excitement as they tell me what they learned in Sunday school. I grew up with lots of Christian education on Sunday mornings at youth group. Great information, lots of truth and lots of history, deep thinking about grace but maybe not so much practical giving of grace?... I knew a LOT and I was PROUD of that knowledge. Also I was clearly RIGHT in all my opinions. God called me into ministry with a parachurch organization and I saw first-hand the faith and grace of Christians who I'd been sure were "wrong." What a blessing. I have a long way to grow in humility still, but I'm thankful to be part of a church now that's full of broken, redeemed people just running after Jesus and holding a hand out to those next to them. In fact when our lives fell apart last year the prayers, advice, practical help and love from our church were God's saving grace for our marriage. Thanks for the giveaway opportunity! Looks like a great thing to read. Yes just went through the whole church drama, the liberals who love and the conservatives who criticize (my short version) . It caused a big split and they all left and started their own group. Families split, children and grandchildren only see each other in tense visits. Thankfully we have left discouragement behind and are going forward in God's grace, mercy and love. We are part of a small, loving church. Little drama, thankfully. This. This post and this book sound like what I need... you can call me jaded because I am. Church has only hurt in the past, but I am so ready for some healing. My deepest wounds have been from people in church. People I considered my family. Through them I learned that love is conditional. Though they said they loved me, it was really only true if I conformed to their every idea and didn't mess up. This has happened 3 different times - and the pain each time it happened was just as raw and hurtful as the first. But...through those circumstances I learned that God's love truly is unconditional. He loves me because he made me. It's his approval that I need to seek, not that of man - which is refreshing because people are people. Somebody's always gonna be made about something. LOL It was a freeing day when I quit caring about what other people thought and just focused on pleasing the Father. I've survived several churches, but remain "a sinner, condemned, unclean." Since I don't have a church story, I'll tell you what I am wearing. It's a clash of stripes really. Black & white striped button down (little stripes) with a turquoise cardigan and jeans, but then black and gray striped sock - think big stripes going the other way. It's okay. I like my clashing. Sounds like an interesting read. Wondering if Varina is attending the North Texas Book Festival? I don't have a church story to share so I will tell you what I am wearing. A sweater. Longing for tank top weather. It's been a long winter. Love your blog. My sister became pregnant at the early age of 16. Instead of praying with us about it, the elders of the church came to our house to tell my mother that she was a terrible mother to have allowed this to happen. They berated her time and again about it. Suddenly we were excluded from all fellowship. It was a big wake up call. We didn't leave that church, rather that church left us. I still belong to the church I grew up in, but since our little town has grown, it's not the same church at all. Eleven years ago there was a split and, oh, the pain we have seen--over and over and over again. I feel we are just now (please, God!) coming out of it. It becomes so easy to make it about us instead of about Him or them. But I couldn't imagine life without my church family. Thank you for sharing - this really hit me at the most perfect time in my life. That book sounds like a delicious read!!!! I am looking for a new home Church since Jeanne Oliver's Becoming class. My friend brought me to her mega-church for our town of 20,000. I met a lot of really nice women and was excited about going to bible study with them. Until - I received a letter from the church asking me to fill out all kinds of information about myself, including financial. It went on to say that a Deacon was going to be coming to my house to interview me to decide if they thought I was a good fit for their church. I was beyond angry, I thought church was about loving Jesus and getting to know God better. Needless to say, I have not gone back to that church. Something that a sweet elderly lady at my church once told me, many years ago, comes back to my mind so often. She said "People will always disappoint us, the only one that never will is Jesus." I have experienced deep pain inflicted by other members of Christ's body, imperfect broken people just like me. I have also been the one inflicting pain, however unintentionally, and disappointing people. THAT is a hard pill to swallow for sure! I have had to extend grace and thankfully have been granted grace by the ones I have hurt. Just something to consider. I would love to read Jaded! Argyle blue knee highs, holy jeans, an old owl tee from a pair of tatget pajamas I bought for my trip to the hospital for the night my son was born. He's 14. Target is underrated. I work at a church. There's much that has to just roll off my shoulders and even more I have to heave off intentionally to make room for Jesus's yoke. I don't quite know where my church story begins or ends but my plot line is far off center too. I keep seeking Him and He keeps showing me love so I'll keep seeking. The lines will fall on whichever side of "supposed to", and I will keep going toward what I believe. Still going on my church story from the day I was born until now--52 years later--I've always gone--some good, some bad, but mostly good. Love, love your blog!! I love your family -- someday I would love to adopt (my mom was adopted). I love my church -- it's a small church in the middle of nowhere, so we don't have much of an option but to love each other and get along together. I know I am blessed to not have run into problems in the church. Would love to be entered; will likely read this book even if I don't win. Thanks for the opportunity.